Church of God Ministries has appointed Ken and Keli Oldham to serve in the Middle East. Ken and Keli will pastor a congregation and assist the national church as requested in their assigned country. In addition, they also will work with the Three–Worlds team, especially in its connections within the Middle East. 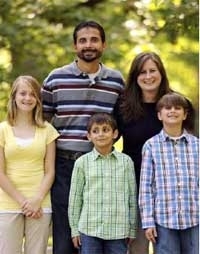 Global Missions is working with the Oldham family to raise their funding for an anticipated departure date of Fall 2011. Their families share a rich heritage of dedication and service. Ken was born in Anderson, Indiana to Bill and Lucy Oldham. His father met his mother on an Anderson College Tri-S trip to her native country of Guyana, South America. The family attended Church at the Crossing in Indianapolis before his father began pastoring churches in Indiana, Alabama, Louisiana, and West Virginia. Ken’s grandparents, Ed and Meriam Oldham, served as missionaries in Guyana as well as serving churches in Texas, Louisiana, Mississippi, Indiana, and Colorado. Keli was born and raised in Detroit, Michigan. Her parents, Frank and Pat Camper, served in pastoral positions in Michigan and Ohio. Keli grew up with a tender heart toward urban ministry, originally planning to study social work. Ken and Keli met and married as students at Anderson University; they both graduated in 1995. Since then the Oldhams have served at Scott Memorial Church of God in Tennessee, Riverchase Community Church in Alabama, and currently at Sixth Avenue Church of God in Decatur, Alabama. They both feel that their role as lead pastors of the Sixth Avenue Church of God has ignited their feelings for spreading the gospel globally. The church has a long, proud history of involvement in state ministries. Ken has been actively leading his church to live out their mission statement, “Touching the World for Christ,” by getting them involved in cross-cultural ministry. Guyana was their first partnership; testimonies of these first steps to partnership were published in Missions magazine and ONEvoice! magazine. Relationships of support and prayer continued with the churches and leaders in the United Kingdom, Japan, New Zealand, and Colombia. This growing engagement of missions within their own community and the world began to transform individuals as well as the culture of Sixth Avenue Church of God. During this same time, Ken and Keli reached out to Franco and Bea Santonocito, engaging Sixth Avenue in an ongoing relationship of service, love, and prayer. Franco and Bea had expressed a need for young leaders to take over for them as they neared retirement. They asked Ken and Keli to pray about becoming those leaders. Although Ken and Keli dismissed this as a nice gesture, they still prayed. In praying they felt that God was indeed leading their family to go. In November 2009, Bea had health issues that ultimately led the Santonocitos to retire earlier than expected. Throughout 2010, the Oldham family became convinced that God was not only calling but also uniquely equipping them to serve as needed in the Middle East. Please lift up Ken, Keli, and their children, Grace, Titus and Zeke, in prayer as they prepare for service in an area of the world where security is a concern.